This term we have been working on a science based theme around materials and their properties. To engage our students with cross curicular persuasive writing we decided to adapt parts of this to focus on the "three Rs." Hmmm Back to basics ay! A real vote winner in the past, but in this case not "readin' 'ritin' and 'rithmetic" (though we have done lots of this too) rather the Three Rs in question have been how we can "reduce, reuse and recycle." cause and effect and logical connectives. What persuasive texts look and sound like? Who might write these and why? It is difficult to be passionate about something unless you have experience of the ideas behind it. In order to give context and purpose to the outcomes we wanted to develop the students were immersed in "topic based activities" beyond the literacy hour to support their knowledge and understanding of the key ideas they would need to engage with in the process of writing. Persuasive writing is an interesting and complex sub genre, in that even though classified as Non Fiction, texts are constructed around the feelings of an author. They may appear to find their origin in "fact" but are usually driven by the emotions and opinions of an author based on their interpretation of facts as they see them. They may appear to be objective, but usually present only one side of a potential argument. Helping students to understand this, requires that they attempt to put themselves in the shoes of their audience and begin to develop some empathy with the other side of the case, inorder to choose relevant ideas they can express that appeal to both sides or those without their experience. Close with a reassertion of the opening statement using either a slogan, an assertion or a question. Within the overall process of exploring texts and developing our writing, we made audience the key focus for our work. Moving into phase two of the unit we gave the students an audience and practiced and applied the ideas we had been developing through the guided and shared writing of letter to our caterers. This sought to persuade them how composting of food waste was a great idea, giving our reasons why, and inviting a response. We know that many of the materials we discard in school are recycled or reused, but what about our food waste? Our new grounds are vast, so we decided to look at how composting as a process could be used to enhance our surroundings rather than perhaps ending up in a landfill? To make these more "official looking" the students also wordprocessed them, allowing them to use some of the visual features we had discussed to be included during the publishing process. In building up to our final Writing Outcome, which was to produce a TV advertisement or Video Presentation, we also read these British TV advertisements with voice overs by Eddie Izzard and Jane Horrocks, as well as this interesting stop motion project by simondo89 I discovered on You Tube. Refering back to our Marking Ladder and success criteria for "writing," we investigated how these videos used similar ideas to persuade. The students identified the use of slogans and Logos as key tools to stating opinion and asserting ideas, but also how the use of visuals such as gesture alongside music were used to persuade us that "recycling was cool." We used comparison charts to review the three videos gradually over several sessions, looking at one initially to identify features that supported our big idea. If the advertisements are telling us that recycling is cool how are they doing this? What makes us think or feel this way? In The Eddie Izzard Example, the voice over was seen as cheeky and quirky, presenting a casual almost throw away idea. We got to this point via the expression by one of my class that the voice over was "idiotic." This invited discussion around what she meant by this, and lead to time spent unpicking the idea and why the voice might have been prersented in this way. In addition students mentioned the type of music chosen, the bright airy look of the scenes, the shiny newness of objects and the fact that the "new everyday objects" presented were highlighted in the video as the cans they were made from. This added to the "coolness" because no one would have anything like them in their homes. The young fellow who was the focus of the story told also had a slinky, casual way about him strutting about the scene, casually casting his can into the recycling bins, and going about his business as if it was everyday. I was really pleased when a number of students after several readings mentioned how the advert also began with the character throwing away his can and ended in the same way... The advert itself was "kind of recycling." As can be seen in the outcomes later, many of the ideas in this video were borrowed as available designs to use in the works that developed as a result. Looking at the other 2 advertisements we began with these ideas looking for similarities. The Jane Horrocks Advert from the same series used very similar ideas, Here the character from the previous video was seen playing a computer game, skateboarding and collecting points as he collected bottles to recycle. As a result the "coolness" of recycling glass was expressed in almost identical ways, but also afforded the questions around the idea of audience and who the advert might be aimed at? 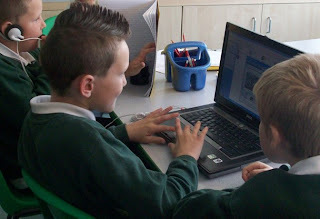 Using clues such as continuity of the central character, the music and visuals we decided that the video was probably directed at us, and how we could persuade our parents and grandparents to recycle. Though the main idea that it was cool, the use of the game perhaps lead us to see how recycling needn't be such a big thing, or get in the way of how we usually behave. The final stop motion project, I think really excited the students as they had recently done some stop motion work, and could see how this advertisement had been been put together. A fantastic tool in as it turns out for engaging them crosscurricularly with the oft neglected ICT curriculum strand 4 statements around "Reviewing, modifying and evaluating work as it progresses." In this video using simple visual tools such as the recycling symbol, items from the bin, an image of the world, lettering from an old newspaper, and a piece of carefully selected music, a really simple message was transmitted by reusing material that could have been found in our bin to persuade, no voice over just a litter dance using throwaways, slogans and captions. The message portrayed used a number of familiar processes, and as such enabled them to begin drawing on prior learning to begin discussing how this had been achieved. 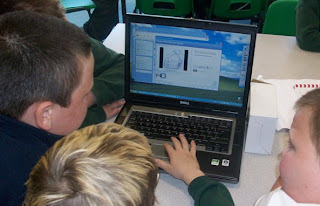 It also began to open up the task we wanted the students to carry out. Helping identify with them the transferable skills we could use from a variety of ICT based processes such as animation, podcasting, video storymaking to contextualise the writing outcome. The final phase of our Literacy Project was to make a short TV style advertisement./video presentation aimed at persuading our parents and other adults that we should recycle. For this we decided to use PhotoStory, the reasons for this I hope will become clear as the process is outlined and you view the completed outcomes . 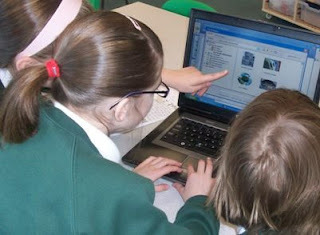 In making the advertisement the children worked in groups of 4. Firstly they planned and then scripted their voice overs using the structure and success criteria above. Using the script as a frame we used Flickrstorm and Google Images to locate and save 5 images that we thought would support and help express our ideas. These images were imported to Photostory and sequenced. The text tool was used to place our slogans or key message on the first frame and to add credits to our final one. The children then rehearsed there voice overs, considering how they would express their ideas before.. 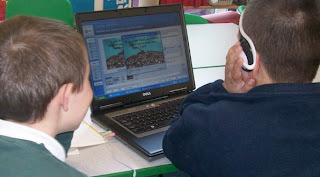 Using the inbuilt voice recorder and microphones to record each child's contribution over the appropriate image. I love the outcomes of which these are only three examples. They are starting points on a journey that I feel reflect the children's emergent and growing understanding of how these text types work. Slogans and opening statements include ideas like "Don't Turn Away," "Prepare to be Amazed," "Our World Could Look Like This." Attempts to grab attention! An appropriate choice of Emotive images or bold and borrowed ideas to open and close their advertisements. Use of simple cause and effect sequences such as, how composting feeds worms, who feed the birds and this is Good for them and must be "GOOD FOR YOU!" and assertions of ideas such as "It is up to you!" The sense of fun in the experience from a student perspective is also eveident as they attempt to include features they experienced in reviewing advertisements eg singing part of a script, and how their reading process is developing with experiences from storytelling and podcasting sneaking in as they find themselves inadvertently inferring and improvising through prediction rather than verbatum use of scripts. These videos were entirely self produced and I feel indicate an increasing understanding of how advertisements use paritcular features to atttract an audience in order to persuade. Underpinning this is the student voice and their rehearsal of concepts and ideas from beyond the text as they work to organise their ideas as sense making structures. They are I think nice examples of first steps in the use of video as an independent tool to express ideas, and as starting points for evaluation and review as we plan the next steps in our learning. asking questions around school about what happens to our "rubbish,"
have developed a sense of ownership around the work we have developed. The students have begun offering their services to help recycle, if other classes sort their rubbish, delivering it to appropriate places around school during break and lunchtimes. As a result of a "bin audit" from the staffroom this week, students have suggested the need to create posters that offer advice to staff and other students about how they can improve their 3 Rs. Our completed advertisements have been placed on the VLE to share with our parents at home, though not being able to wait it seems one student arrived yesterday, knowing we were about to make our advertisements with a flash drive, so she could take her group's home to share after school. Another student out ill yesterday, but knowing we were going to be making our advertisements yesterday, used photostory on his home PC and sent the result to me by email. The students have clearly been excited and highly motivated by the projects with the images throughout this post reflecting the level of engagement and fun associated with developing the outcomes. Next week following the excitement of this process we hope to launch our campaign a little wider with a first public airing during assembly. These videos also present themselves not as an end product but rather potential starting points for future work as reference tools for others as well as ourselves. 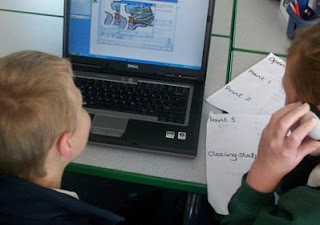 I was privileged last week to experience some of our secondary students working on OCR Nationals coursework, and in addition to use within the Pimary Phase, have begun wondering how as an all through school, these could be used to promote and support continuity and progression, acting as evaluation tools and starting points for older students to evaluate and develop video based projects of their own. The idea of beginning with the work of other students regardless of age, in order to illustrate processes and identify steps for self improvement and development in the quality of outcome would be fantastic. In an all through environment such as ours it would be a really exciting to involve older students taking on and helping to move forward the work of their younger peers, extending work such as this and developing it for their own benefit, while perhaps sharing and presenting new resources that can further enhance the learning and experiences not only of themselves but other students and the colleagues who are learning alongside them. Perhaps in closing my thoughts truly are running away with themselves... However in recycling these videos the Possibilities do seem truly endless.